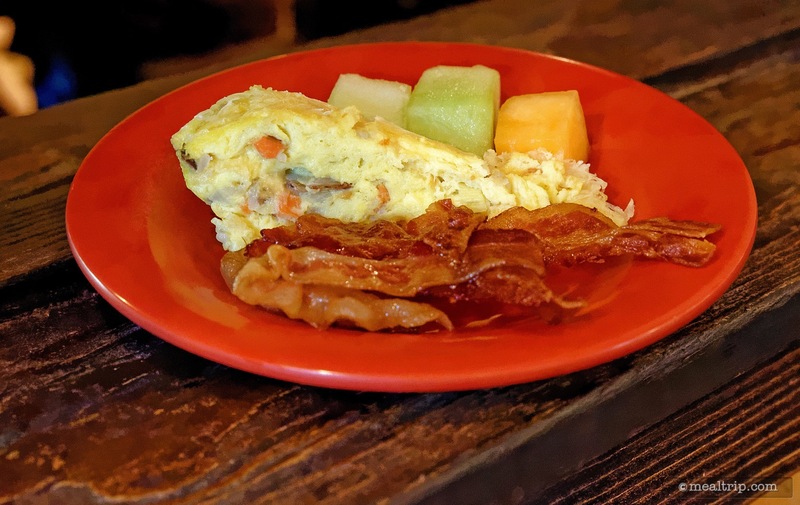 The Tusker House Restaurant Breakfast listing is a Character Buffet dining location at Animal Kingdom featuring Vegetarian Options, American and African cuisine. 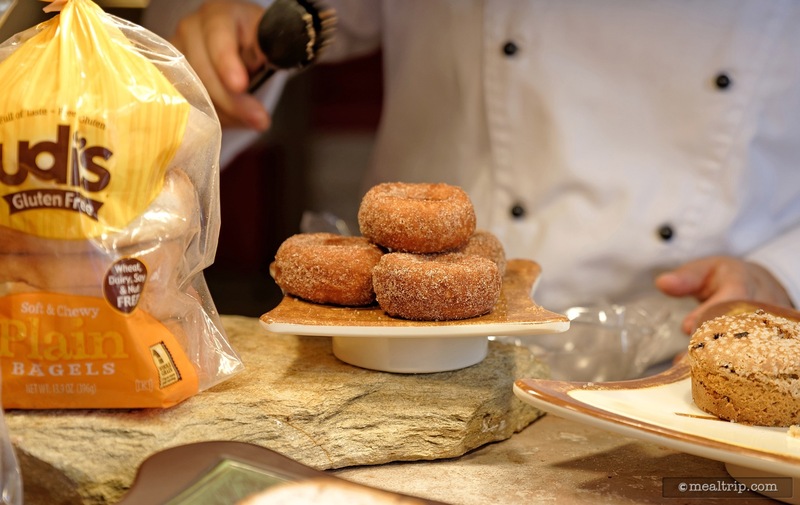 There are 32 photos in the Mealtrip photo gallery for this location and dining period. 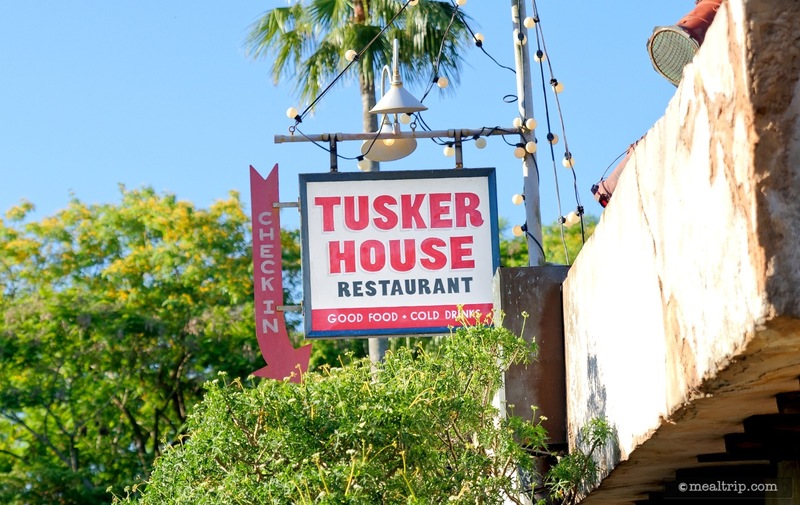 The Tusker House Restaurant Breakfast listing currently has a score of 86 out of 100. 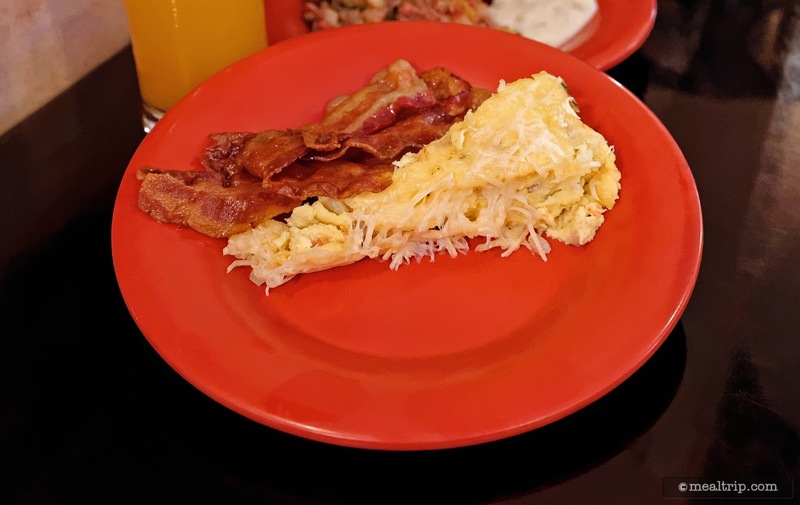 Click here to read all of the reviews for this location, or log in to Mealtrip.com to add your own review for Tusker House Restaurant Breakfast. 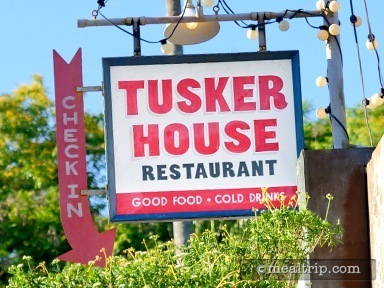 The Check In sign over the entrance to Tusker House. 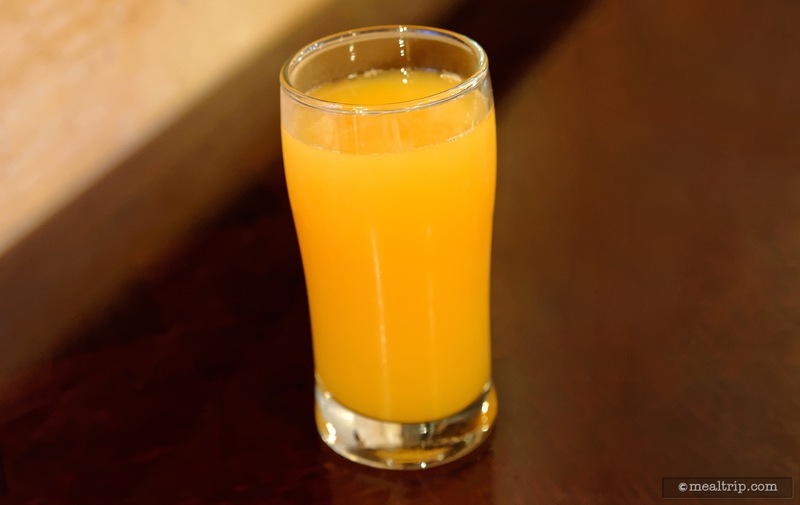 Start your breakfast with a glass of the very popular Jungle Juice, which is basically equal parts orange juice, guava juice, and passion fruit juice. If you are unsure if you will like it, give it a try. There's no cost to switch to something else if you don't like it. For added fun, you can get one with rum in it as well... although there is an extra cost for that! 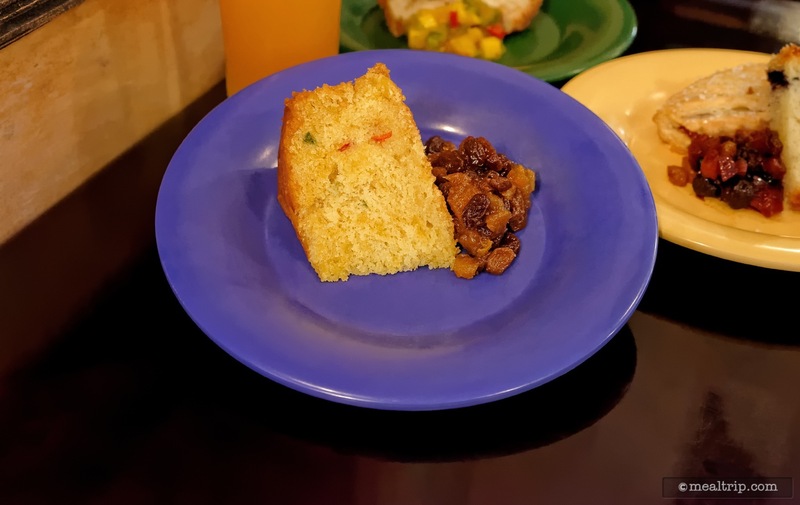 Cornbread, with a hint of cardamom and other herbs, paired with a Light Raisin Chutney. 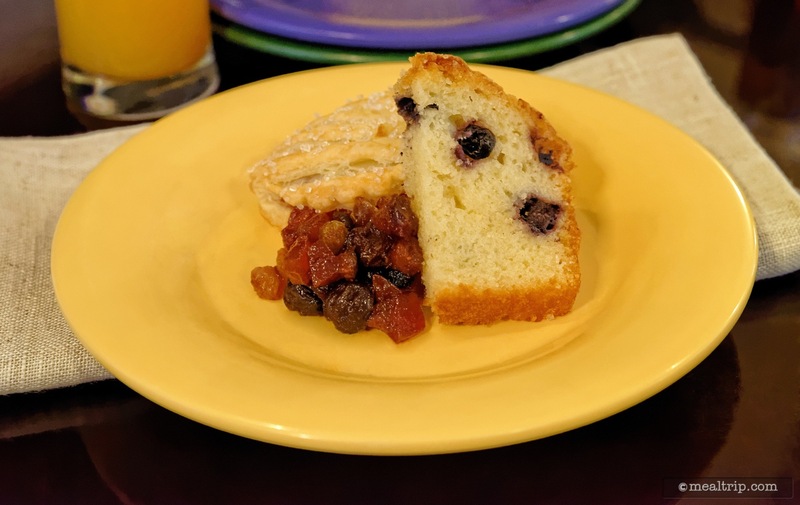 A slice of blueberry bread, some dark raisin chutney, and a strawberry danish with coarse cut sugar on top are plated. 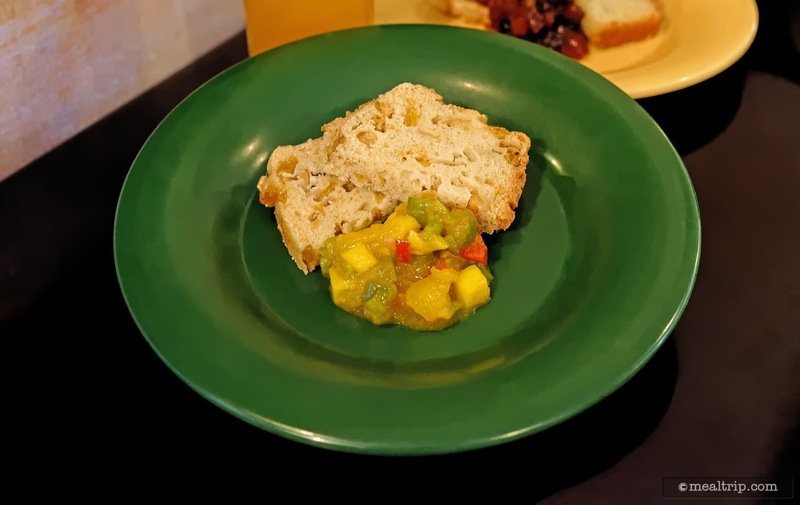 Mealie Cornbread and Mango Pepper Chutney. 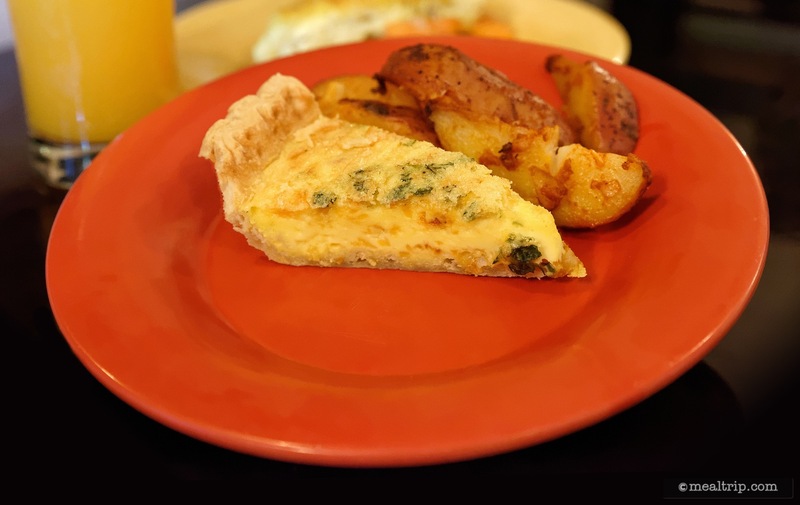 Cheese and Spinach Frittata Oven Roasted Red Skin Potatoes. Beef Bobotie with Coconut Sweet Potato Casserole. Potato and leek Frittata with bacon. 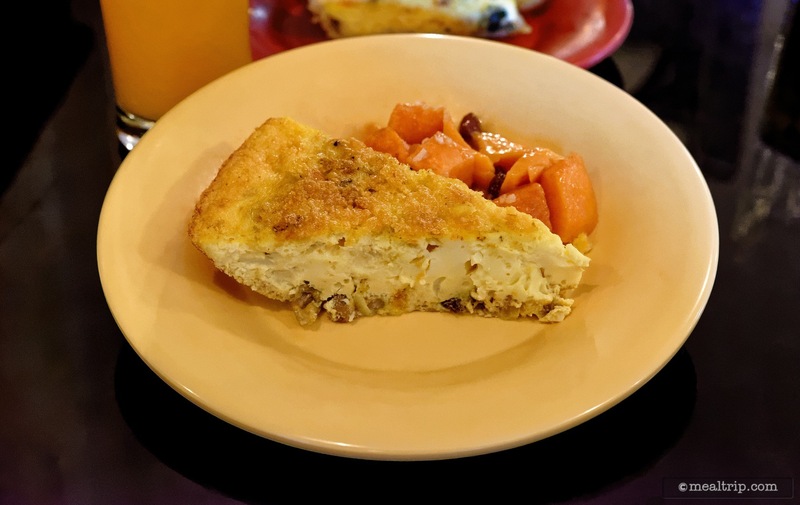 Vegetable Quiche with Bacon and Cut Fruit. 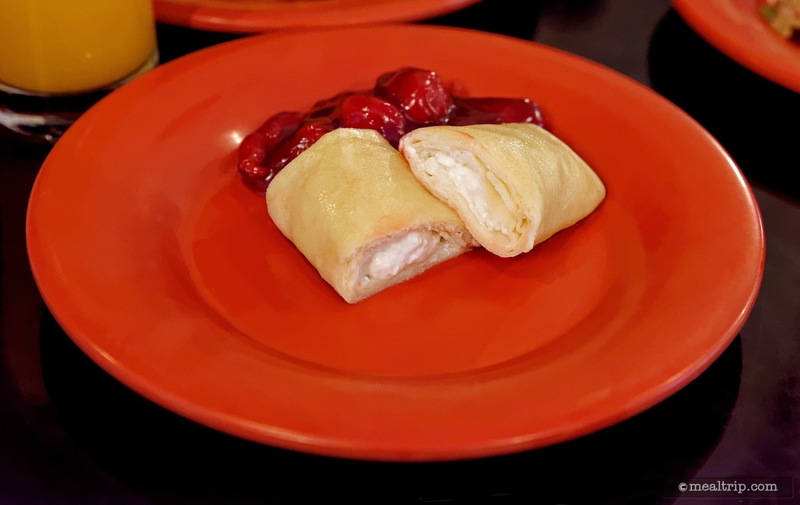 Cheese Blintz (cut in half so you can see the cheese) with Cherry Topping. 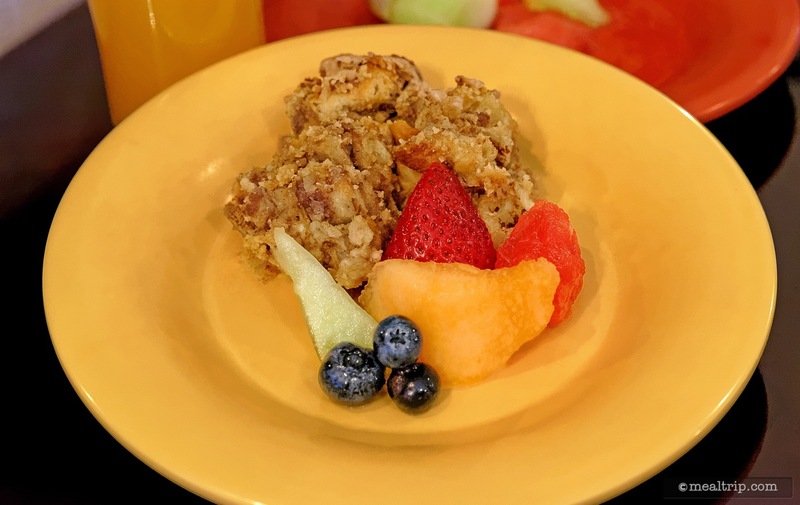 There was no Vanilla Sauce for the Baked Banana Cream Cheese French Toast on the day I visited (sigh) which leaves the bread-pudding-like mix a bit dry and not at all sweet. Together with the sauce though, it might be quite nice. Some fruit from a large cut fruit melody bowl is also pictured. 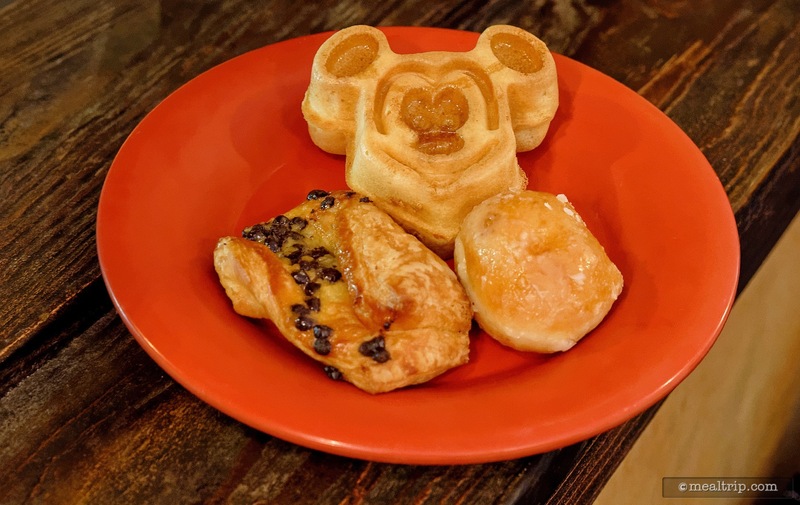 A Mickey Waffle with Maple Syrup, Chocolate Twists and a glazed Doughnut Hole. Close-up of the Tusker House Chocolate Twist. 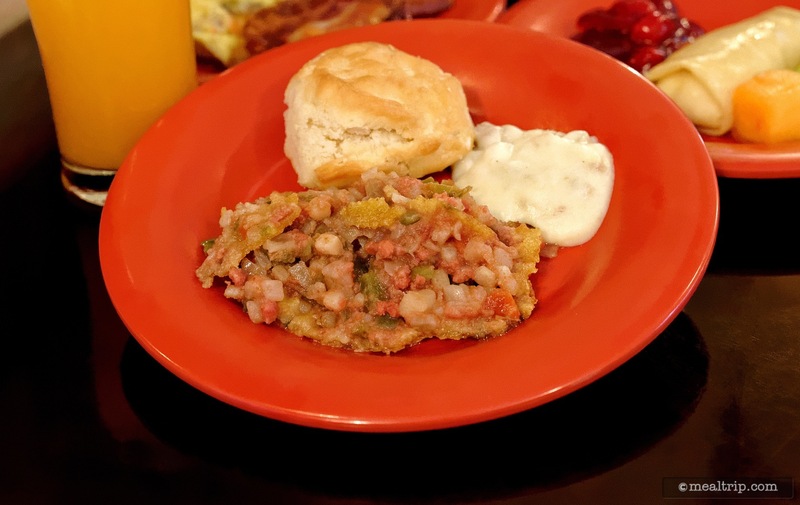 Spiced Corn Beef Hash with Cornbread Topping, a fairly light Biscuit, and savory Sausage Gravy. 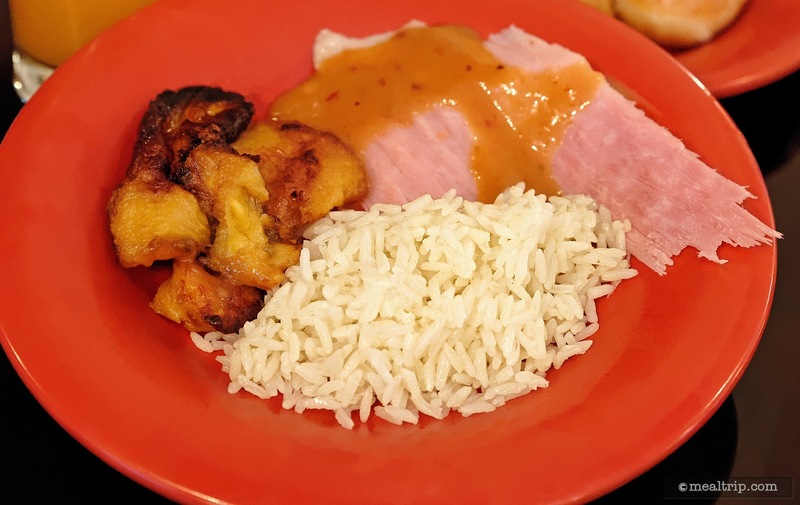 Spit Roasted Bone-in Ham (that is carved to order), with Spicy Honey Mustard Sauce, Basmati Rice with Lemon, Cinnamon, and Cardamon, and a few Sweet Plantains. 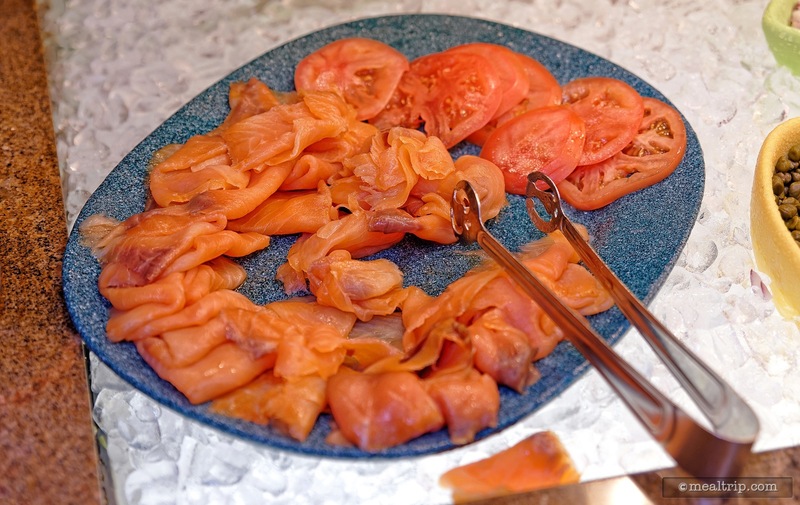 Smoked Salmon and Sliced Tomatoes are plated together. 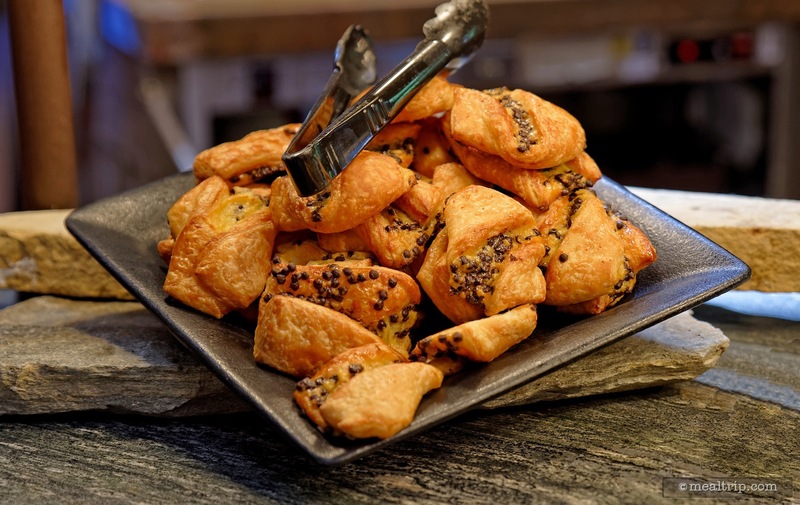 Capers, Onions and Bagels are also available. 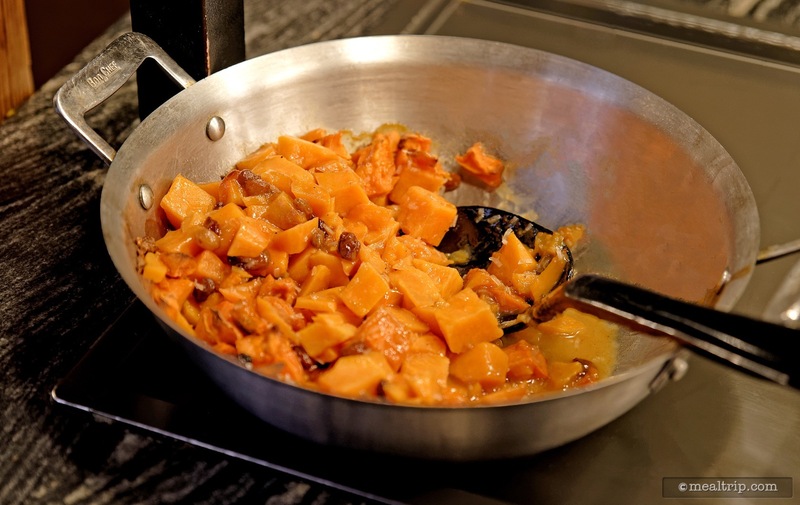 Coconut Sweet Potato Casserole as seen on the buffet line. 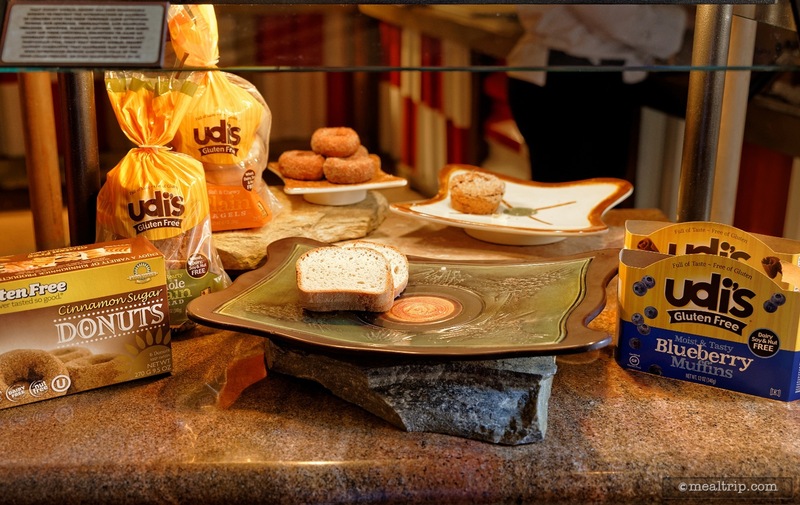 The Gluten friendly station contains a couple of Udis items such as breads and Blueberry and Cinnamon muffins, and Kinnikinnick's Cinnamon Sugar Donuts. All the products are also dairy, soy and nut-free. 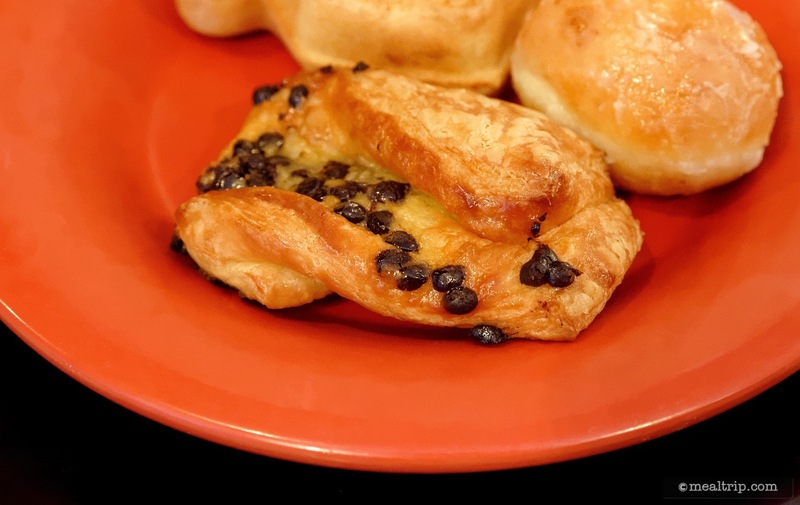 Tusker House's Chocolate Twists are a guest favorite. 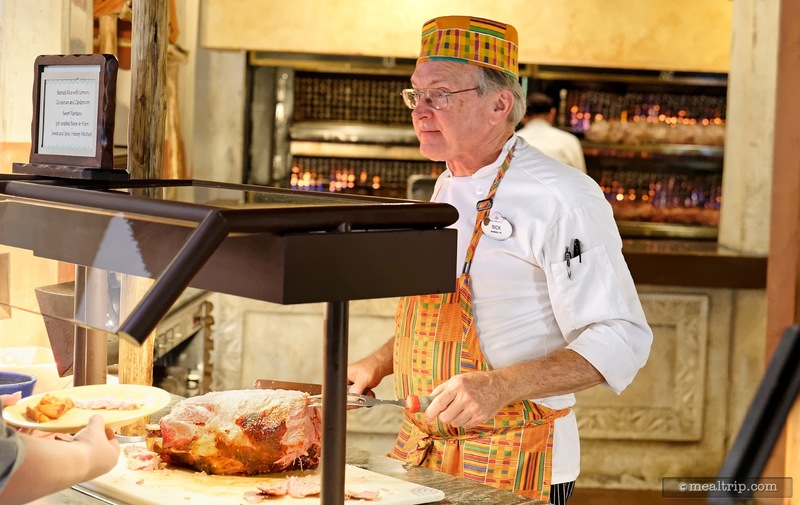 Spit Roasted Bone-in Ham is carved to order at the carving station. Notice the various meats being fire-roasted behind the carving station. 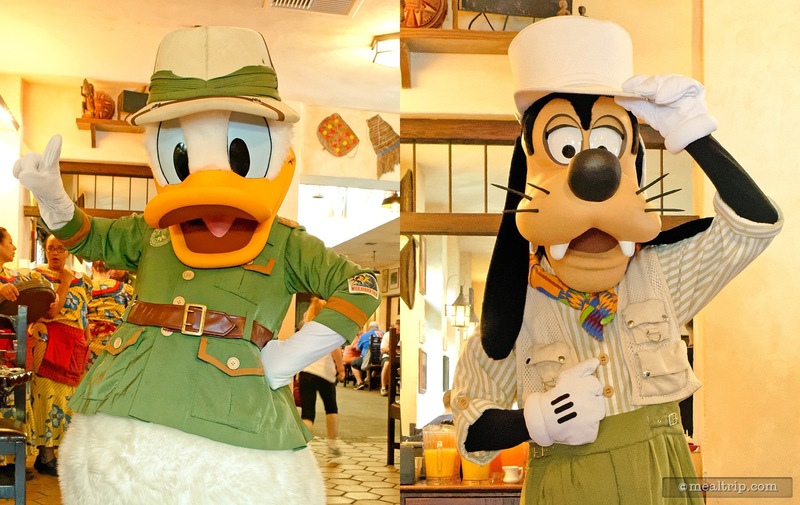 Safari Donald and Safari Goofy meet and greet guests during the Tusker House breakfast at Animal Kingdom. Many of the characters spend ample time with guests and pose for photos which you can take with your own camera. PhotoPass photographers are usually pretty close by as well, but they do not "hard sell" the service. 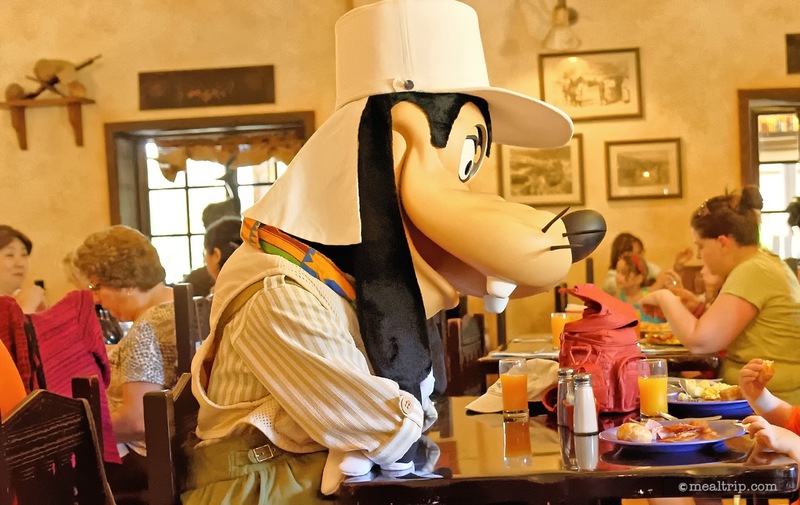 Safari Goofy sits down for a bite to eat during the Tusker House character breakfast. 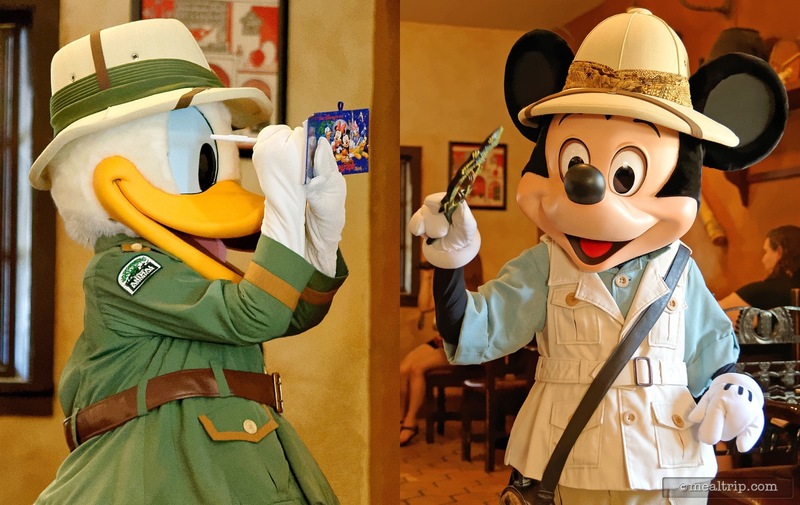 Safari Donald stops to sign an autograph book while Safari Mickey tries to get a "conga-line" going with smaller guests by shaking handheld African rhythmic instruments. 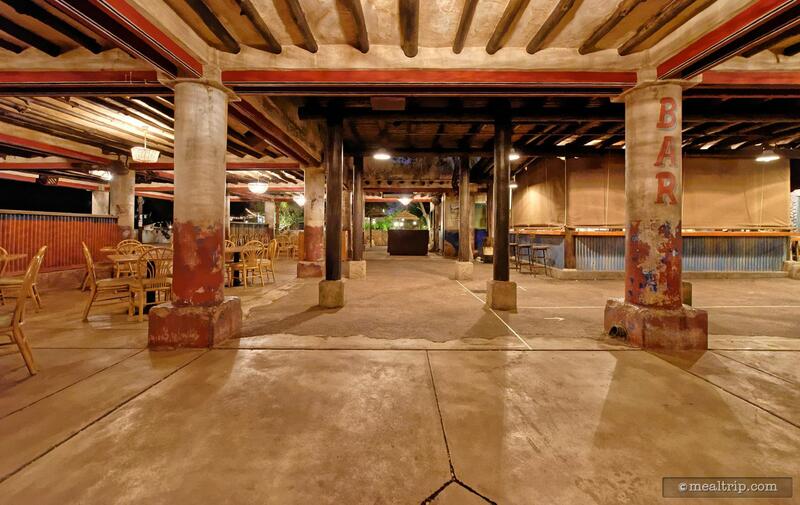 If you get to Tusker House really early, you might see this area empty! This is the "wait for your name" area outside Tusker House. 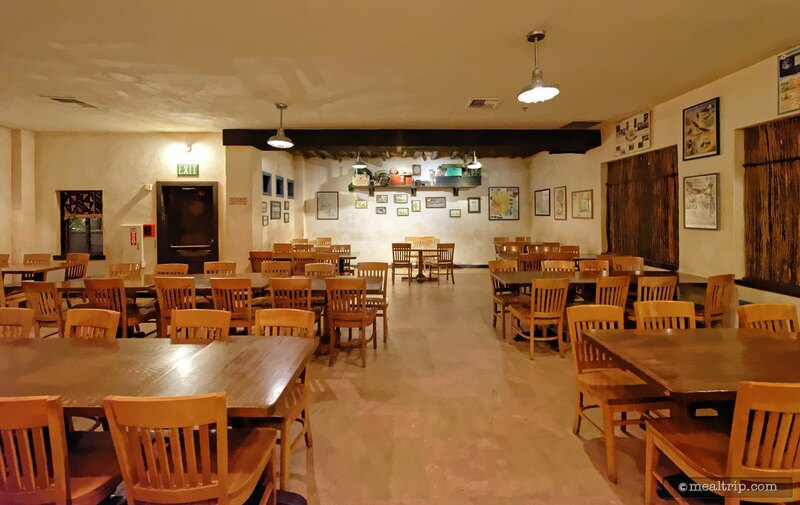 The Dawa Bar seating area is to the right side of this image but, guests generally cruise around the whole area waiting to be called into Tusker House. 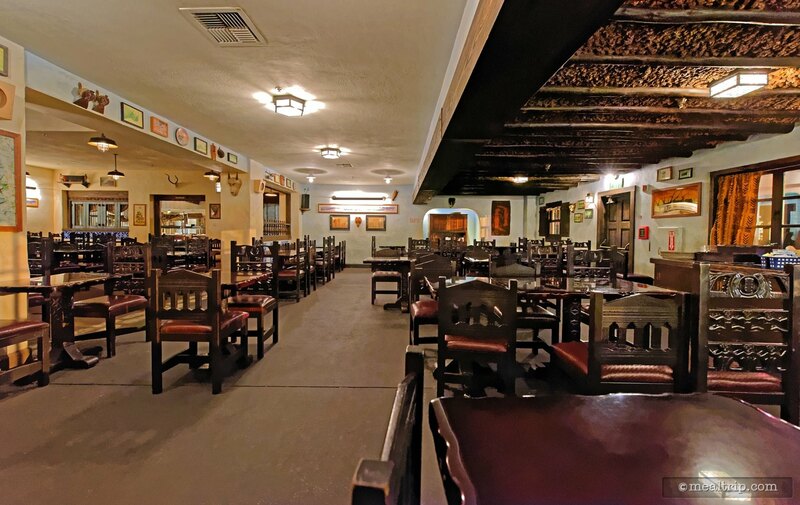 The "main entrance door" opens into the buffet area, a very large hall-like room where your greeter will briefly go over the buffet and character setup. 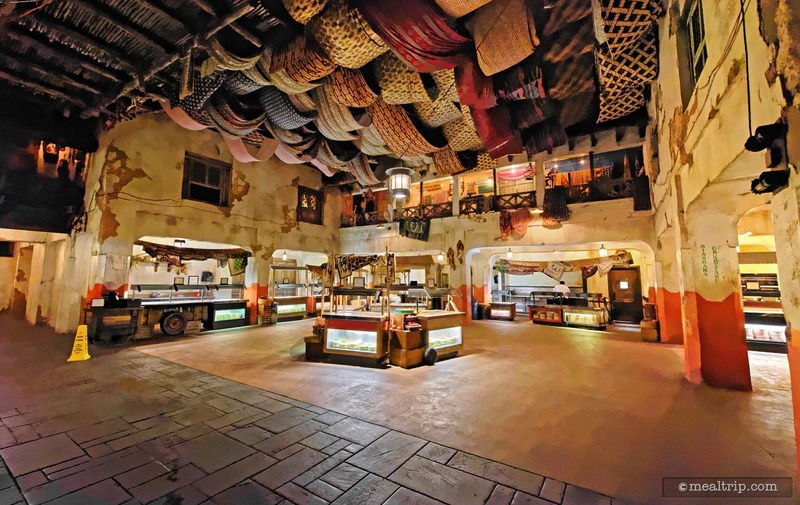 There are four main seating areas at Tusker House. 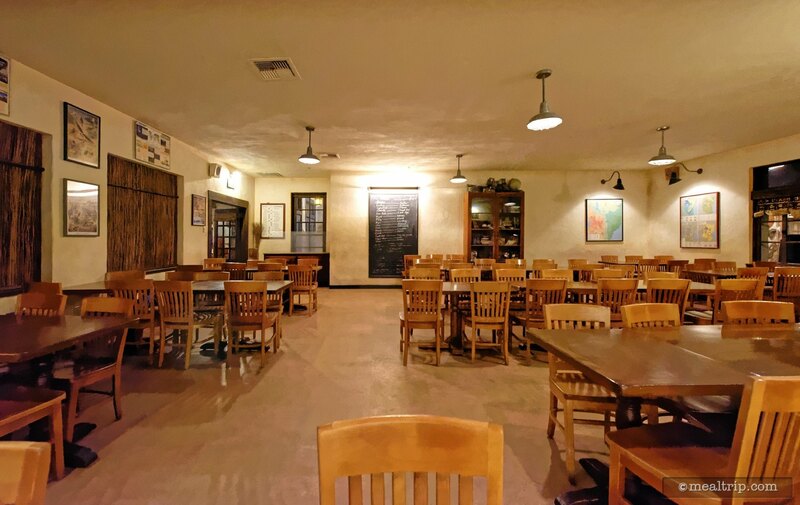 This is what I call "area two", it's the east-most dining room. It's design cues are kind of split in half, some dark, some light. There is cool wall art everywhere in Tusker House. 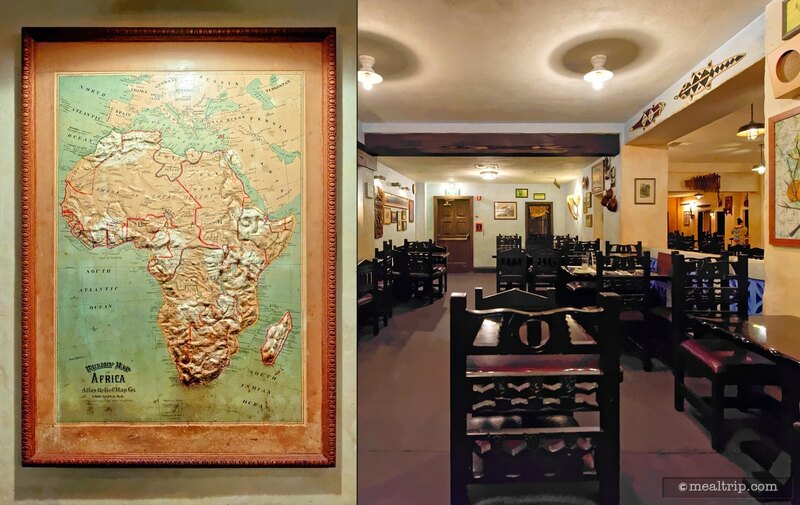 I especially like this tin map of Africa. No two art pieces are the same. This is "room four" at Tusker House. It's the west-most dining area and the one that feels cut off from the other three dining rooms. Occasionally, this is used for private events, or very, very large parties. I have always found "room four" at Tusker House to be a bit cleaner for some reason, but the ambient noise is louder than the other areas. It's more of a self-contained room that the other "open air" type areas. 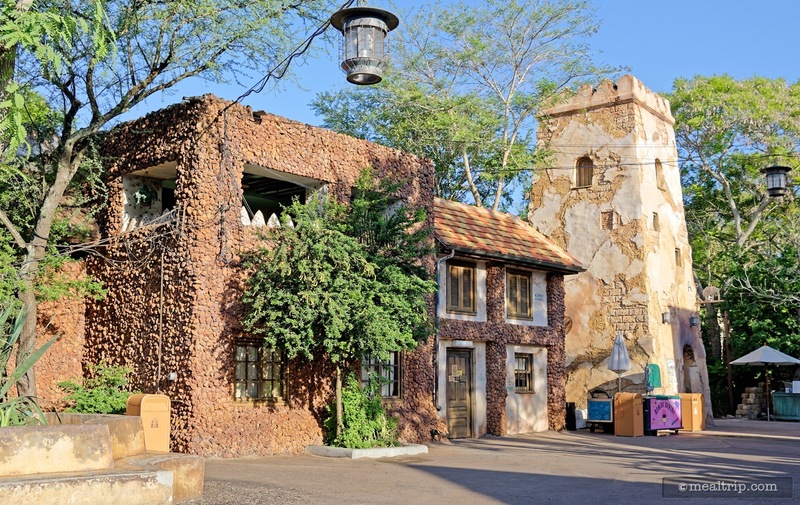 Although this building doesn't quite look the same as the entrance to Tusker House, it is actually where the buffet food is located. You can not enter Tusker House from this building though. The exterior doors only have handles on the inside. This shot of the Tusker House building was taken on the walkway that leads to the Lion King Theater. 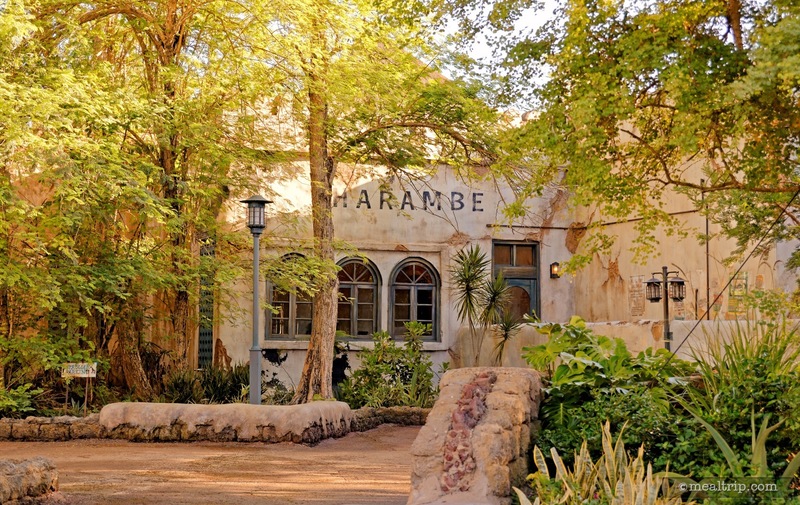 The windows under the word Harambe are for a smaller side-dining area that is usually open for seating, but can sometimes be reserved for large parties and special occasions.